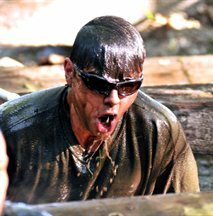 Step Up For Soldiers 3rd 5K Combat Mud Run April 27, 08; 00 at the 1/120th Nation Guard Armory. Located at 2412 Infantry Rd. Wilmington, NC. 5k of rugged trails with 28 obstacles, climbing walls, flooded ditches, tire hill to name a few. This year we've added and additional mile w/obstacles for the seasoned runner. This is a timed event with several age categories, male and female individuals and team runs. Early registration $40.00. Step Up For Soldiers: An All Volunteer Group Providing Renovations, Recreation, and Recognition for Recently Disabled Veterans.